A properly made cappuccino and pastries at Roscioli Pasticceria, in Rome. One of the joys of Italian life is the coffee bar. Even though we have a lovely espresso machine at the farm, Italian coffee bar culture is probably the thing I miss most about Italy when I’m not there. One orders at the cash register, takes the receipt to the bar, watches the barista make up to four or five coffees at a time with care (hopefully), and enjoys the drink quickly at the bar. It’s possible to sit down at an Italian coffee bar for an additional charge, but it’s stopping in for a quick coffee at the bar itself which is, to me, the most delightful thing to do. I’ve very rarely had bad coffee in Italy. Some places are certainly much better than others. Some take pride in the drinks they’re making. Some are just going through the motions. Some properly clean their equipment, while others are sloppy. Some source beans with attention to quality. Others just use industrial beans. But even at their most average, coffee in Italy is usually delightful. Milk is properly frothed and served at the right temperature (not 1000 degrees). Cups are properly pre-warmed. Not as successful are the pastries at coffee bars. Although they are wonderful compared to the dreadful pastries one often finds at coffee shops in the US, the harsh truth is that 90% or more of coffee bars sell industrial pastries, as Katie Parla thoroughly detailed in an article in Eater.com last year. In a development which has significant improved my life, the historic and respected Roscioli bakery has recently open a coffee bar a mere 5-minute walk from the property in Rome where I teach and live a few weeks a year. Not only do they make their coffee with care, they are one of the few bars which produces their own pastries from quality ingredients and eschews industrial shortcuts. The difference is immediately obvious both by sight and taste. 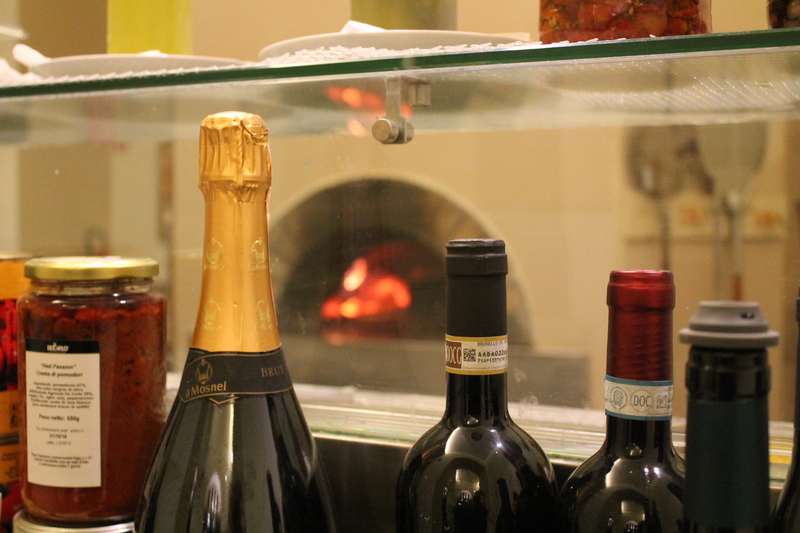 It’s easy to romanticize Italy and assume that quality is more common than it is. Sadly, there is not enough demand for quality from tourists or even Romans to ensure it. Nonetheless, the few who do produce exceptional products of excellence are diamonds in the rough, and I for one am deeply grateful for them. A horrific example of a cappuccino from a bar in Venice, one of the few Italian cities where it is in fact very hard to find a well-made coffee. Note the “soap suds” type frothing, the mark of an amateur. It was also about 1000 degrees and impossible to drink. Terrible. When I started cooking in the late ’90s, there were no cookbooks focusing specifically on Rome, at least that I could find. But a few years later there was a flurry of publication: David Dowdie’s Cooking the Roman Way, Jo Bettoja’s In a Roman Kitchen, and Maureen Fant’s Rome (Williams Sonoma). After another few years of quiet, a new crop of Rome cookbooks has suddenly burst on the scene offering an abundance of riches for those interested in the cooking of the Eternal City. First, I offer an apology for not including a discussion of Rome: Centuries in an Italian Kitchen by Katie and Giancarlo Caldesi. It has only recently come to my attention and I haven’t had a chance to spend time with it yet. When I do, I’ll report back. But I have spent time with three new books on Roman cooking: Eating Rome by Elizabeth Minchilli, Tasting Rome by Katie Parla and Kristina Gill, and My Kitchen in Rome by Rachel Roddy. You might wonder whether the market needs three new books on Rome. But these three books differ so much in content and tone that it wouldn’t be at all redundant for someone interested in Rome to own all three. Elizabeth Minchilli’s Eating Rome was the first published, and it is perhaps the most diverse in its content. In addition to recipes, it is full of charming stories as well as copious recommendations of where to shop, eat, and spend time in Rome. Minchilli is American, but moved to Rome with her family in the 1970s when she was 12 years old. They only stayed two years, but after numerous repeat trips for vacation and graduate school, she eventually married a Roman and has lived in Rome ever since. Having spent three decades in Rome, her breadth of experience is hard to match. For the sake of full disclosure, I must say that the second author, Katie Parla, has been my friend and mentor in all things Roman since I started taking my high school Latin students to Rome and hired Katie to do our touring. I quickly learned that her expertise in the Roman culinary scene equalled her expertise in Roman art, history, and culture. So when I heard that she would be publishing her first cookbook, Tasting Rome, co-authored by Kristina Gill, I was pumped. Katie has an exceedingly rare gift of excellent taste. I’ve been let down many times by restaurant recommendations, but rarely from Katie. She has high standards, and like the late great Marcella Hazan, doesn’t suffer fools or fakes. She has strong opinions and doesn’t keep them to herself. This makes her writing compelling, especially on her blog. Her cookbook is beautiful. While it doesn’t have the breadth of Minchilli’s book, it more than makes up for this with its depth. It doesn’t try to do everything, but what it does it does very well. Perhaps its most unique and valuable characteristic is the extent to which it offers recipes from some of Rome’s finest chefs. The gnocchi recipe is the recipe from gnocchi master Arcangelo Dandini. The spaghetti alla gricia recipe is from Claudio Gargioli of Armando al Pantheon, to me the restaurant with the most exquisite rendition of this dish. 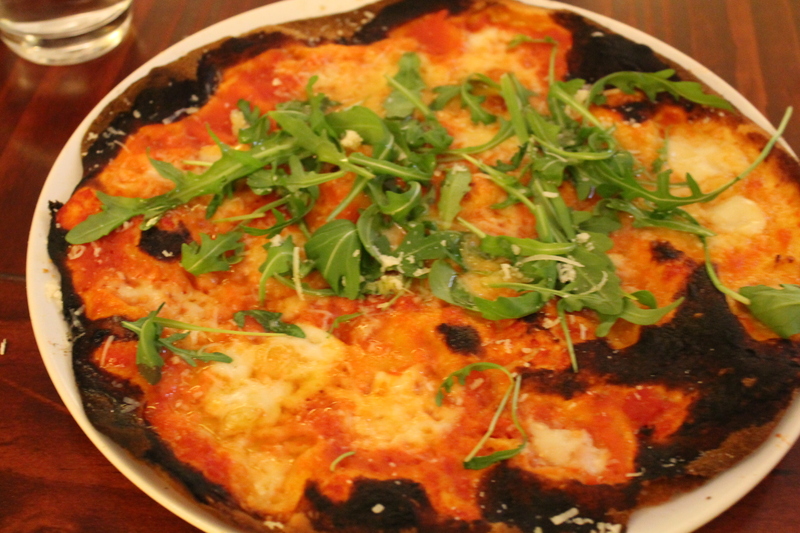 The amatriciana is from Nabil Hassen of Roscioli. The fact that these chefs were happy to share their recipes with Katie for the book is a great testament to Katie’s reputation in Rome. Having recipes from masters such as Arcangelo, Claudio, Nabil and others elevates and ennobles Katie’s book. If there is a shortcoming to the book, perhaps it is that it’s surprisingly impersonal, and Katie’s personality doesn’t come through as it does on her blog. But it is a very important book, and one that I am thilled to have. Last but not least is Rachel Roddy‘s My Kitchen in Rome. To me, it’s the best title of the three. The original British title of the book, Five Quarters, might be even better, as an homage to the importance of offal in the Roman kitchen as well as as a metaphor for the frugality and honesty of Roman cooking. But the American title, My Kitchen in Rome, is pretty great too because it immediately brings to mind a homely, personal, and authentic quality which is the book’s greatest characteristic. Rachel came to Rome about 10 years ago and hardly intended to stay. But as for so many others, months turned into years. 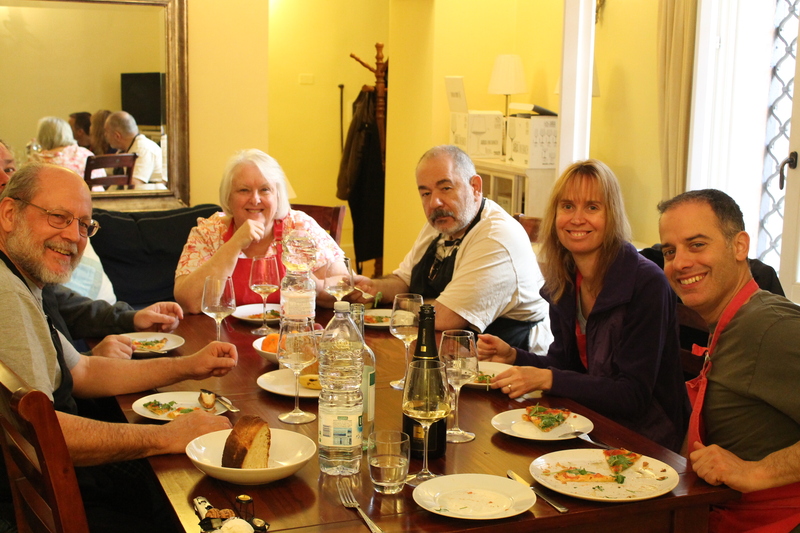 Back home in England, cooking had played a part in her life, but it was a part amplified and enriched by cooking at home in Rome, in particular in the Testaccio neighborhood which has informed so much of Rachel’s cooking and which she writes so lovingly about. Rachel is refreshingly honest about the limitations of her kitchen: tiny, no exhaust fan, improvised equipment. It’s a reminder that good cooking comes from humble surroundings. But in the loving descriptions of her kitchen, of her neighborhood, of her husband and child, of her favorite restaurants, markets, coffee bars, and butchers; in her loving descriptions of all of these, Rachel communicates a real sense of her personality, a real sense of herself, and this makes the cookbook both rare and a treasure. All three of these women have come to know Rome as an adopted home, and all three communicate in their own ways their love for the city. All three have blogs. But despite the similarities, all three offer very different books, each of which is worth adding to your collection. Learning to season correctly is the most important skill a cook can learn. A few years ago I wrote a love letter of sorts to Armando al Pantheon, my favorite restaurant in Rome. I have to do it again. I’m here in Rome for one night on my way to teach two weeks of cooking classes in Bologna, and once again I was just blown away by the meal I enjoyed at Armando. I have had the pleasure now of introducing many clients to Armando over the past few years, but I have not dined there alone in a while. No restaurant is perfect. Last year they seriously undercooked our pasta. But I know of no restaurant in Rome that more consistently delivers perfection time and again than Armando. What’s so amazing about it is that being a stone’s throw from the Pantheon, they could do a great business without caring at all, just dishing out mediocre food to tourists who would be delighted to eat anything while on vacation in Rome. What’s amazing is that Armando still cares. They understand the elusive quality of good cooking, and they deliver time and again. They understand that cooking is personal, not something one can just train anyone to do well. Good cooking must have character. And as Marcella has emphasized, good cooking must be seasoned properly. When I think of Armando, seasoning is what I think of. I’ve written a lot about salt, and rightfully so. What has so impressed me about the cooking at Armando is the perfection of their seasoning. It is tempting in restaurants to go overboard, to ensure that the first bite is overwhelmingly delicious but to create the problem that the more one eats the more one finds the dish too intense. I don’t think I’ve ever eaten food that is so correctly seasoned as at Armando. It gives the illusion that the food hasn’t been salted at all. It is so discreet, so much in the background that it never draws attention to itself. Yet, the seasoning is playing the key role in the deliciousness of the food. The other key is moderation. 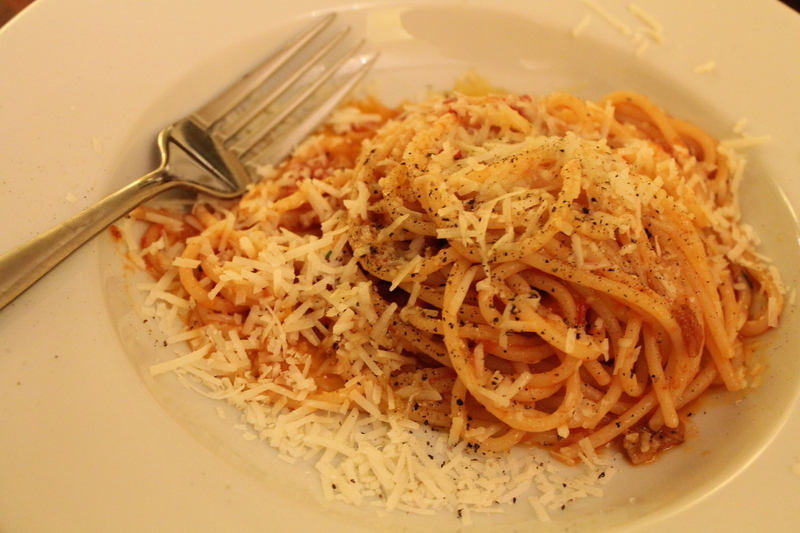 The first dish I ever ordered at Armando years ago was Spaghetti alls gricia (with guanciale). When it arrived I was surprised to see an extremely lightly dressed pasta, with just a few pieces of guanciale. And perhaps the first bite underwhelmed. But unlike many restaurant dishes, the more I ate the better it got. Armando understands the principal that it is just as important what you keep out of a dish as what you put in. The result is cooking which is light, balanced, and clear. 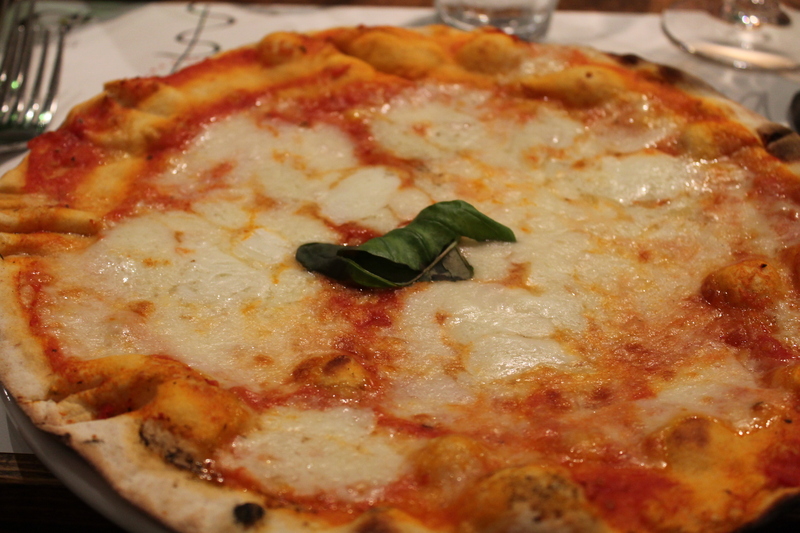 We still have seats available for our next culinary tour to Rome in March. If you’d like to join us for a week of cooking, culture, and fellowship, e-mail me: justin@oldtiogafarm.com. You too can discover the magic of Armando. In my last post, I mentioned a dessert I hoped to make at the restaurant in August if I had perfect peaches to work with: baked peaches with amaretti cookies. The truth is, it’s still a great dessert even with imperfect peaches. And if there are still peaches in your market, I highly recommend giving this one a try. Actually, this might be the best time of year to make it because although it’s made with warm-weather peaches, to me it’s perfect on a cool September night like tonight. The recipe is an Italian classic, memorialized by countless Italian cooks and cookbook writers. My version is derived from Rachel Roddy’s wonderful book My Kitchen in Rome, which deserves a blog post in its own right. The only place I differ from Rachel is in cooking time. She recommends a 40-minute bake time. I like even longer, at least an hour, or even more depending on the oven. I like them really concentrated, though not burned. The only challenging thing about this recipe is finding amaretti cookies, especially finding the best ones. For many years I used a domestic brand, which was fine. But when I finally used a high quality imported brand, the difference was obvious. Amaretti are made from bitter almonds, and good ones taste of it. Here is the one I’ve been using recently. Slice three or four peaches in half, scoop out the pit, and place skin side down in a baking dish. Combine 6 crushed amaretti cookies with ¼ cup sugar (white or raw), 1 egg yolk, a little lemon zest, and 4 tablespoons softened salted butter. Spoon the filling into each cavity and bake at 375 for one hour, or even longer. The peaches should be concentrated and maybe a tiny bit crisp at the edges. Serve immediately or later at room temperature. The first indication that all is not right with gnocchi recipes is that they directly contradict each other. Some say that one must only use Russet baking potatoes; others say that Russet potatoes won’t work. Some say you need an egg. Others say an egg will ruin the dough. Some say to boil the potatoes. Others say they must be baked. Some insist on using imported Italian flour. Others say American flour is just fine. Some insist on giving the gnocchi an impression by pressing them against a fork. Others say to skip this cosmetic step. Some say that making gnocchi is “easy and simple.” Others write that they have mastered it only after decades of experience. What in the world is going on? My introduction to gnocchi came through Marcella Hazan’s excellent book The Essentials of Classic Italian Cooking, which was my daily guide in the early years of learning to cook. She says definitively that the potato must be neither too mealy (like a Russet) nor too waxy. It must, moreover, not be a freshly dug “new” potato, but one which has aged a bit and become an “old” potato. She also says definitively that though some cooks even in Italy use an egg, it is looked down upon and creates a rubbery product which some refer to as “Paris style” (tells you what Italians think of Parisian cooking). I don’t really remember my first attempts years ago to make gnocchi, but I know they weren’t encouraging. Concluding that gnocchi just weren’t that impressive, I lost interest in them for years. Then I found myself in Rome under the tutelage of Katie Parla. After complaining to Katie about some mediocre gnocchi I’d eaten the night before, and after hearing her explanation that many places serve low-quality gnocchi made from dehydrated potato flakes (yuck), Katie took me to L’Arcangelo, not too far from the Vatican and Castel Sant’Angelo. She assured me that Arcangelo Dandini’s were the finest gnocchi in town and some of the best in all of Italy. That is high praise, but Arcangelo’s gnocchi didn’t disappoint. After years of hearing that gnocchi should be like airy pillows but never experiencing anything close to that, the first bite at L’Arcangelo was a complete revelation. They were indeed weightless and exquisite. Sweetening the deal further, he had sauced them with the most exquisite expression which I had ever had of the Roman pasta sauce all’Amatriciana (tomato with guanciale and pecorino). It remains one of the finest dishes I’ve eaten in my life. And on each return visit, the same experience has been consistently repeated. Desperate for some inkling of Arcangelo’s secret, I begged him for advice. He explained that the key was to boil the potatoes in equal parts salt and water. Of course, equal parts salt and water is more like a slurry than anything to cook potatoes in. Maybe something was lost in translation. Maybe he was just pulling our leg. But it did lead me to an intriguing discovery: Syracuse salt potatoes. Salt potatoes originated in Syracuse, New York, when salt miners would boil potatoes using the local salty water from the marshes near the mines. Using an incredible salt ratio of 1 cup of salt for 6 cups of water, this method raises the boiling point of the water so much that the potatoes cook at a higher temperature and the water more completely cooks the starch, giving the potatoes a remarkably firm but creamy texture. Though one would imagine that so much salt would make the potatoes inedible, their skins protect the potatoes, which hardly absorb any salt at all. I had a hunch that something like this might be what Arcangelo was talking about. But when I made them using the method described by Marcella and also her son Giuliano, I still had heavy, gluey gnocchi. Although I revere Marcella Hazan, I began to doubt that her recipe could produce the sort of gnocchi I was looking for. So I began to look at other recipes. I quickly learned that about 95% of all gnocchi recipes call for Russet baking potatoes (the kind Marcella says won’t work) and an egg. The most exacting of these call for baking rather than boiling the potatoes, which makes sense. Since adding too much flour is the downfall of gnocchi, and since the drier the potato, the less flour will be needed, it seemed logical that baking the potatoes would decrease their moisture and make for lightly gnocchi. So I tried this method, but to no avail. They were edible, but not the ethereal gnocchi I was seeking. I even went to a cooking class taught by a chef I greatly admire. She too called for baking potatoes and an egg, and her gnocchi were good, but they weren’t the ethereal gnocchi I was seeking. A friend of mine was also seeking to master gnocchi, and we would commiserate at the seeming impossibility of the task. If not for my taste memory at L’Arcangelo, I would have dismissed gnocchi and given up. Then, poring over recipes and articles online and in books, I noticed that the most authoritative sources still seemed to argue for making gnocchi without an egg. When I learned from Katie that Arcangelo also makes eggless gnocchi, I knew that must be the way. Just as importantly, these sources argued for making gnocchi not with a baking potato, but with another type: Yukon Gold. This is a potato that I know well. It is the primary potato we grow in our market garden for our vegetable customers. What is it, I wondered, about the Yukon Gold potato which makes it superior for gnocchi? This question led me to the single most critical piece of information about gnocchi-making. Since most of us don’t grow potatoes, we don’t know much about them. In stores, they have meaningless names like “Eastern” potatoes, whatever that means (nothing). But then, I happened upon this magnificent chart describing the different textures and cooking characteristics of various potato varieties. 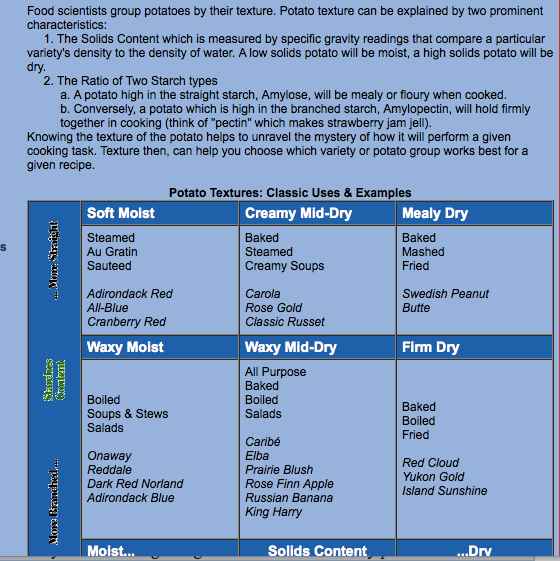 This chart shows that potatoes actually have two kinds of starch, not one, and that those who say that Russet potatoes are more starchy than other types have no idea what they’re talking about. They have more of one of the types of starch, amylose, which makes a floury or mealy potato, and less of the other type of starch, amylopectin, which causes the potato to hold together when cooked. Moreover, some potatoes are more moist than others and some are more dry than others. When I thought about gnocchi-making, where you want a dry potato that holds together when cooked, and then I consulted the chart to see what varieties fit that bill, right there I found the Yukon Gold potato (along with several other varieties one never sees in a store). At once it all made sense. If you use a baking potato, no matter how dry you get it, it is a mealy, floury potato which will fall apart when cooked, and which therefore requires an egg to help the dough hold together — even if this leads to a heavier, rubbery result. Dough made with a Yukon Gold, however, has enough amylopectin that it will hold together on its own, without need of an egg, and since it is a dry type of potato, it will require minimal flour. Hugely encouraged by this knowledge, I humbly realized that I had come full circle and that Marcella and Giuliano Hazan had been right all along. I made a batch using Yukon Gold, the dough came together easily and held together, and my first bite, though not quite at Arcangelo’s level, was the first bite of gnocchi I had ever made which could be described as weightless. Unfortunately, I wasn’t able to immediately repeat my success. I had been using Italian flour and I got a bad bag which ruined my next batch. My third attempt was ruined with too much flour. Just as I thought I was getting somewhere, I began to question whether my one success had been a fluke. Everyone says to use as little flour as possible, but when I used as little as possible (about 100 grams for 800 grams potatoes), the gnocchi tasted too raw, too much of straight potato, and they weren’t weightless. But then I had my final epiphany. Rereading Giuliano Hazan’s recipe for the hundredth time, I gave adequate attention to a phrase I had passed too glibly: incorporate flour until one has a smooth dough. I’ve been cooking seriously for fifteen years, but what the heck does a smooth dough mean? How smooth? What should it look like? Feel like? This information is almost always left out. Every gnocchi recipe always stresses to not overwork the dough or they’ll be tough, just like the instructions for pie dough. But just like with pie dough, the invocation not to work the dough often leads to the opposite error: underworking the dough, being so scared to handle it, that the ingredients never become fully incorporated. I had figured this out years ago for pie crusts – that you had to work the dough enough to get a homogeneous mass that actually came together – but I hadn’t really applied it to the gnocchi dough. I had been working it so little out of fear of overworking that the dough really wasn’t homogeneous or smooth as Giuliano says. On my next batch, I gently massaged in the flour until the dough was completely smooth and homogeneous. I boiled and tested one gnoccho and it still wasn’t right, so I increased the flour to 150 grams (about 1 and 1/6 of a cup) and the gnocchi suddenly and miraculously became ethereal. I realized that too little flour could be a problem too, even if the gnocchi held together, and that there was a magically sweet spot, which for me was 150 grams of flour, though I imagine this could vary widely depending on what potatoes one uses and how one cooks them (I was still boiling them in a high salt water). Of course, just when you think you’re home free, one finds disagreement over how long to cook gnocchi. Some say till they float. Marcella says till they float and then 10 seconds more (adding or subtracting a few seconds as needed). Huh? A second of cooking makes a difference? Others says to cook them for a minute after they float. One once again feels like one is in a house of mirrors. To make matter worse, how can you tell if they’re floating if you have water boiling violently and they’re being knocked all around? My breakthrough here came just several days ago, courtesy of Rachel Roddy. She very sensibly points out that the gnocchi should cook at a gentle simmer (almost a poach), not a tempestuous boil like pasta needs. When I cook them that way, it is immediately obvious as soon as they float. For me, they cook in 1 minute and 45 seconds, a very short cooking time which to me suggests light and airy gnocchi. How do you know you’ve made them correctly? When cooked they should be solid in appearance, not grainy or dissolving, but they should be ethereal. What do I mean by ethereal? Think of the most weightless pancake you’ve ever eaten, one that seems like a cloud, compared to heavy, dull pancakes. Likewise, think of the most light mashed potatoes, as opposed to heavy, dull ones. You should experience that same thrill when eating gnocchi. There are still questions I don’t have a definitive answer to (does the salty water really matter? ), but I’ve been able to repeat my success enough to feel confident offering my recipe as a likely candidate for successful replication. Ironically, gnocchi are very simple in one sense — but in another, they are one of the most challenging things I’ve ever learned to cook, and one of the dishes most difficult to teach through the written word. If ever there was a time to stand at the side of an experienced cook, this is it. 1) Bring 1 quart of water and ¾ cup salt to a boil. The Hazans do not call for this heavily salted water, and perhaps someday I will eliminate it, but for now it works for me and seems in line with Arcangelo’s advice. The potatoes will not become saturated with salt unless their skins break, which has never happened to me. The extra salt seems to firm up their skins and keep them intact. Paula Wolfert, who has excellent advice about gnocchi and admits that she only recently mastered gnocchi after cooking for 40 years, recommends baking the potatoes instead. I have not had success with that method, but I can’t dismiss it and others might find even better success with the baking method. 2) Add 1 ½ pounds Yukon Gold potatoes, all of a similar size. If you can’t find Yukon Gold, you can try another plain boiling potato, but you’re taking a risk. I know it seems silly, but you could always mail order the Yukon Gold. Or grow them yourself! Cook the potatoes until tender, about 30 minutes, until easily pierced with a toothpick. I keep the heat on medium low and keep the potatoes covered to reduce evaporation of the water. 3) Immediately slice the potatoes in half and peel the skins. They are hot, but use a towel if you need to. They need to be peeled right away and passed through a food mill or ricer. Some swear by the former and others by the latter. I use the ricer. Rice or mill them onto a well-floured wooden board. Total flour needed will be 100 to 150 grams, including the flour on the wooden board. I measure out two bowls, one with 100 grams and one with 50 grams. I know I’ll need at least 100 grams, and then I use as much of the remaining 50 as I need. 4) Some people, including Paula Wolfert, recommend allowing the riced potatoes to cool. I haven’t found that it helps, but you might try it. I actually like to work the dough while it is warm. It feels softer and more pleasurable. 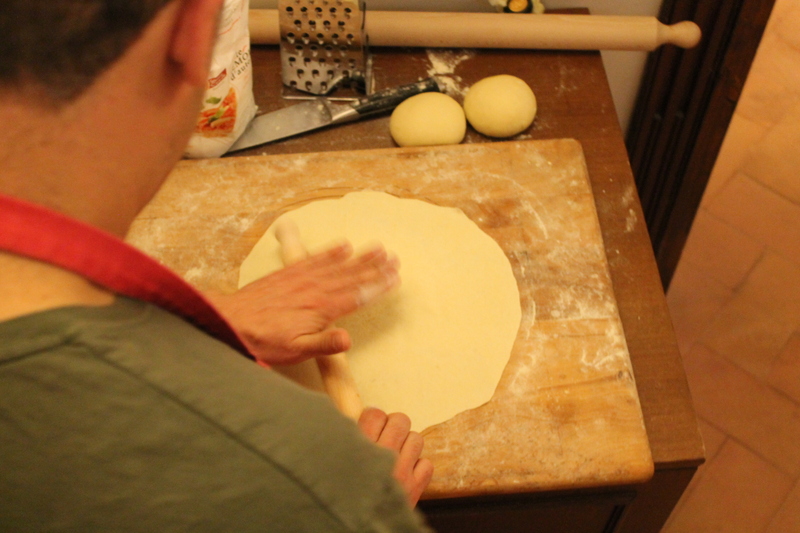 5) Add the remainder of the 100 grams and massage the mass gently into a soft, smooth, and homogeneous dough. It will be tacky but not sticky. It will be a beautiful gold if you use yukon gold. You won’t see flour and the dough will feel soft and lovely. 6) Cut off a piece, form it into a little gnoccho, and throw it in some boiling water. Check it when it floats. If it falls apart or still tastes too raw, add some or all of the additional flour. There is no simple answer here. Only practice and experience will teach you the right amount of flour. I’m still learning myself. According to Anna del Conte, the best gnocchi makers in Northern Italy use only 100 grams of flour for one kilogram (about 2 pounds) potatoes. For me, that’s not enough. For me the sweet spot is consistently 150 grams. I should add that I am using imported “00” Italian flour. I have no experience with American all purpose flour when making gnocchi, but that is what the Hazans recommend. I believe unbleached pastry flour would also be a good choice. Italian flour is more finely milled than most American flour, and the kind of flour you use will affect how much you need. Only experience will teach you. 7) Once you are satisfied that the dough is right, cut off a tennis ball sized piece and roll into a snake, cutting the piece in half as needed to make it manageable. I like larger gnocchi and aim for a ¾ inch thick snake. I cut off 1 inch pieces and I DO NOT use a fork to make an impression on the gnocchi. The traditional argument is that the irregular surfaces of “forked” gnocchi catch sauce better, which I do not find to be true. Arcangelo doesn’t indent, and that is good enough for me. 8) This amount of dough makes about 50 gnocchi, depending on the size, which is 6 moderately sized portions. I only cook about one third of them at a time in 2 quarts of water seasoned with 1 tablespoon salt. Unlike pasta, which needs much more water to move around in, cooking a small amount of gnocchi in a smaller pot works well for me. Keep the heat at a steady, gentle simmer but not a rolling, tempestuous boil. For me, they cook in just under two minutes, which I take as a good sign that I’ve produced light and airy gnocchi. Heavy gnocchi take longer to cook. 9) Once they float I remove them with a slotted spoon and place them in the pan with their sauce, tossing gently, while I cook the remaining gnocchi. Once all are cooked, serve at once. Just as with pasta, gnocchi go down hill quickly and within minutes you’ll have a cooled, heavy mess on your hands. Really, gnocchi are at their best for 1 to 2 minutes after cooking. 10) Many people suggest that smooth or pureed sauces are best for gnocchi. Pesto and butter/sage are two classics. I disagree, however. 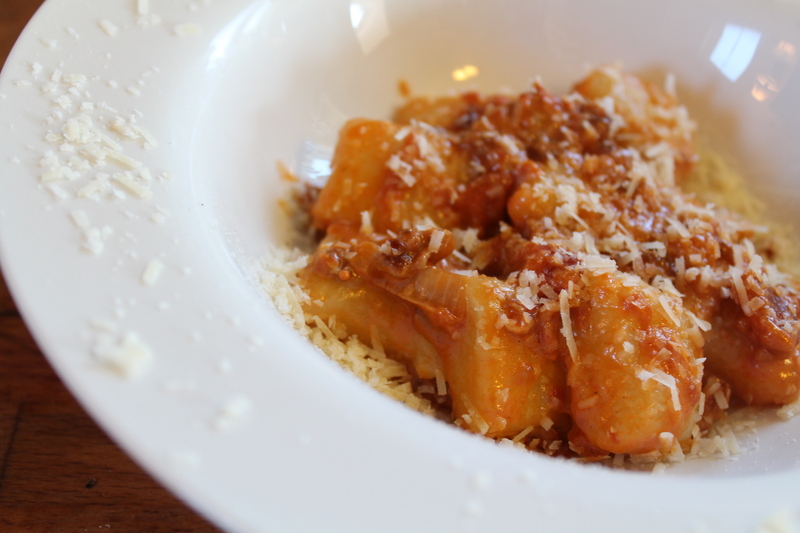 Arcangelo’s amatriciana is perfect with the gnocchi. I’m not completely happy with my own amatriciana, but I am completely enamored of gnocchi with sausages, tomatoes, and cream. 11) To make this sauce for a full batch of gnocchi, brown about 1 cup plain sausage in a little olive oil, and then add about 1/2 cup diced onion. Cook until soft and lightly colored, and then add about 1 cup chopped tomatoes (high quality canned are fine) and a knob of butter. Add a generous pinch of salt and cook until the tomatoes are reduced and broken down, about 5 minutes. Add a moderate glug of cream and reduce until moderately thick. Remove from heat. 12) As the gnocchi are done, toss gently with the sauce. When all the gnocchi are done, plate at once and garnish with freshly grated parmigiano-reggiano.